Oscar Fay Adams. 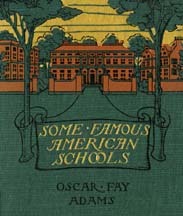 Some Famous American Schools. 1903. Lawrenceville, St. Paul's, St. Mark's. School founded, 1810; refounded, 1882, when the English "house system" was adopted; opened in new buildings, September, 1884. Now contains four hundred pupils; thirty-two masters. Eleven masters' houses. Upper House and Hamill House for fourth form pupils. Two chapel Sunday services. Gymnasium with swimming-pool. Library, 5,000 volumes. Half-holidays Wednesday and Saturday. Five forms, each corresponding to one year's work. Several foundation scholarships, of from $100 to $400. No pupil admitted under twelve. Societies: Calliopean, founded, 1818; Philomathean, founded, 1855; Y. M. C. A. Publications: Olla-Podrida, annual; The Lawrence, weekly; Literary Magazine, monthly; Y. M. C. A. Handbook. Lecture course from November to April: lectures given Wednesday mornings and Saturday evenings. Athletic fields, running-track, golf links, tennis courts. Orchestra, Glee, Mandolin, and Banjo Clubs. Seven trustees of school, including head master. IN the midst of the floor-like countryside which stretches northeastward from Trenton, New Jersey, is the hamlet of Lawrenceville, five miles from the State capital. Originally known as Maidenhead, after the English locality of that name, it became Lawrenceville in 1815 in honour of Captain Lawrence, the famous American naval hero. This burst of patriotism was protested against in town meeting, but the enthusiasts had their way. The territory was traversed by an Indian trail from the Raritan to the falls of the Delaware, a trail which later became the "King's Highway," but since such an appellation could not be suffered to shock patriotic echoes after kings had ceased to have any part and title in the American colonies, the highway was thenceforward known as "The Great Road." In our own prosaic days it is not infrequently styled the "pike," a word very dear to Jerseymen. "A garden here, May breath and bloom of spring." At least so it impressed the writer on the occasion of his first visit to Lawrenceville. Acres of the softest green turf stretch away from the road on this side, and the careful disposition of shade and ornamental trees and shrubbery, of walks and drives, and of the buildings dotted about the grounds, shows the careful planning of the landscape architect. A soft May breeze was blowing when the writer first turned aside from the roadway into the school grounds and the perfume of hawthorn and lilacs drifted toward him. Picturesque, irregularly shaped structures of red brick, but softened in hue, showed themselves in whole or in part here and there among the trees. A warm sunlight suffused the whole, and made it seem like a spot wherein to dream throughout a long summer's day. But only for moment did this impression remain. An unseen bell rang sharply, and like bees when their hive is touched, an innumerable army of boys swarmed out of the huge archway of a reddish brown building at one side of the long oval lawn or campus, and their appearance made it quickly evident that very little dreaming went on in this particular locality. 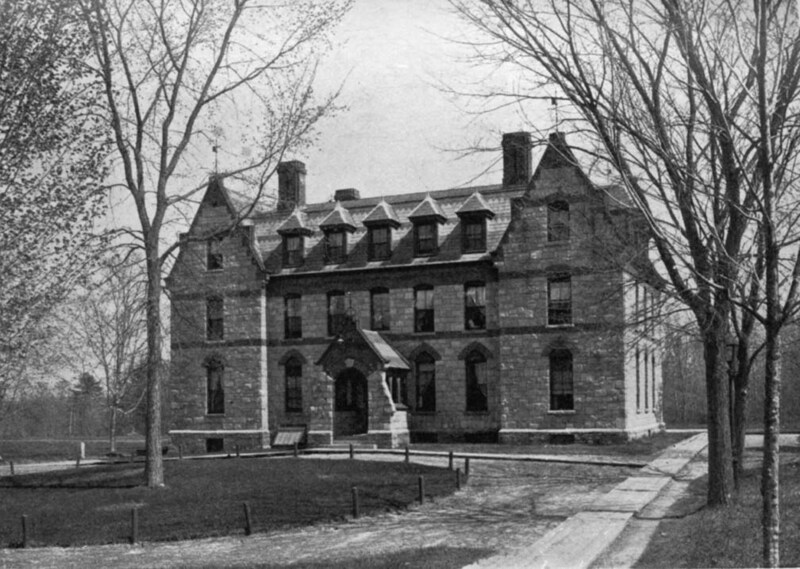 Andover, Exeter, Shattuck, and several other noted schools, have come to their present estate through years of slow and more or less intermittent growth, new buildings being erected as funds available permitted and necessities demanded; Lawrenceville, on the contrary, on its present foundation, came into being in plan, substantially as it is at present, its latest structures, for the most part, having been contemplated in the original scheme and erected in accordance with it. To a lesser extent the same is true of Belmont, while the one comprehensive building of Saint Mark's was in effect contemplated from an early period in the history of the institution. So long ago as 1810 the Reverend Isaac Brown, a Presbyterian clergyman, opened a boys' school in Lawrenceville with nine pupils. Of one of these nine, John Cleve Green, we shall hear later, while another early pupil, if not one of the scholastic nine, as John Maclean, a well-known president of Princeton College. In 1839 the school became the property of the Reverend Samuel Hamill and his brother, the Reverend Hugh Hamill, and under their management it increased in numbers and became much more fully equipped for its purposes. Until 1878 the institution was known as the Lawrenceville Classical High School, and from its modest beginnings in 1810 till the year 1878 some 2,500 boys had been enrolled upon its list of pupils, the larger number of them entering college, and very many of them becoming distinguished in the legal, medical, and clerical professions, as well as in the army and navy. If one may judge from the reminiscences of various pupils during the Hamill period, the régime of the Reverend Samuel appears to have been one in which leniency and justice were blended in about equal proportions. Very possibly it might be best described as a benevolent despotism. Up to 1878 Lawrenceville was not strongly differentiated from numbers of other American boarding-schools. It was an excellent institution, but so were very many others whose rank to-day is much what its place then was. But a radical change was in store for Lawrenceville --- a change due in all human probability to the circumstance of John Cleve Green having been one of the original boys who attended the school in 1810, a lifetime earlier. He was but a boy of fourteen when he quitted his Lawrenceville home for New York, where his innate business faculties developed so rapidly that his employers sent him to China to represent the firm. In its main lines the tale is familiar, and has been told of many beside the Lawrenceville lad. He prospered, as merchants had a way of doing in China, married the daughter of the head of the firm, and returned to America after twenty-five years, prepared to enjoy the fortune he had amassed. Charitable institutions ere long became acquainted with his name, and Princeton College knew him as a benefactor, its scientific school resulting from his generous gifts, the Chancellor Green Library and the academic department being likewise enriched by him. Then, in 1876, he died. In those years while he was accumulating a fortune among the slant-eyed sages of Cathay his three brothers had been graduated from Princeton and had risen to prominence in the affairs of New Jersey. Henry W. Green had become chief justice of the Superior Court and afterward chancellor; Caleb A. Green was judge of the Court of Errors and Appeals, while George Green was now a wealthy lumber merchant; a very fair showing for one family. 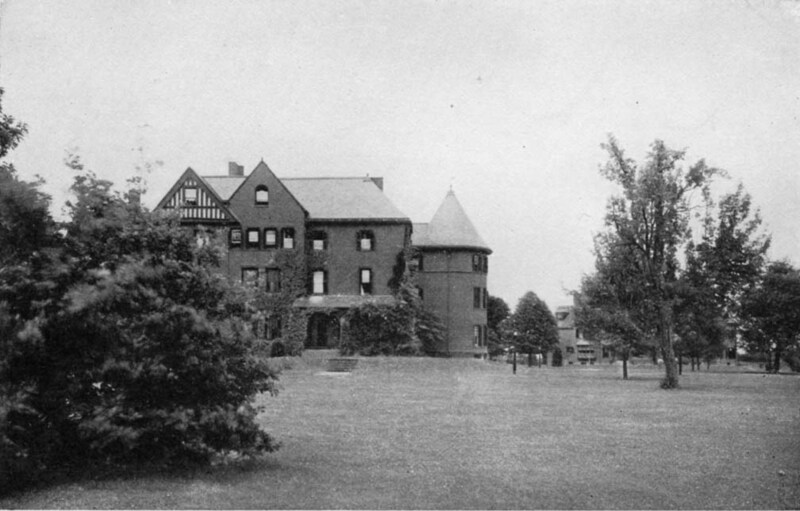 John's surviving brother, Caleb, his nephew, Charles E. Green, his friend, John Nixon, and his widow were named as residuary legatees of the larger part of the Green estate, and in 1878 these four purchased from the Hamills all the property of the Lawrenceville school. They had become convinced that an endowed preparatory school for boys was much needed in the Middle Atlantic States, and particularly in New Jersey, but this might have remained in their minds as a theory only, had the China merchant not died childless. Each of the legatees possessed a fortune which did not need augmenting, and by a happy chance it occurred to them to employ the fortune left to their disposition, in establishing an institution that should perpetuate the name of the Lawrenceville schoolboy of so long ago, as well as that of the school where his mastery of the three R's had been obtained. That Mr. John Green had ever contemplated such a disposition of his property is extremely doubtful, but that it was quite in harmony with the general trend of his desires is most probable. In 1881 the legatees obtained a charter for the school, and the next year appointed James Cameron Mackenzie, Ph. D., head master, requesting him to prepare an outline of the domestic and educational policies of the institution to be henceforth known as the "Lawrenceville School on the John C. Green Foundation," a formidable title, which fortunately admits of considerable abbreviation. A board of seven trustees was then elected, and the school has ever since been controlled by them. Everything was now ready for what might be termed a fresh start, and very speedily was the start made. The grounds were enlarged by the purchase of neighbouring farm lands, landscape architects appeared on the scene, red brick structures began to rise in this or that quarter, while the thin sound of the trowel clinking against the bricks was heard on all sides. When labourers, architects, gardeners, and engineers of various sorts had done their work and gone their several ways, the school began its life in the new buildings in September, 1884, having continued the earlier school system since 1882 under the new administration. The new system was not only entirely different from the one it supplanted, but it differed essentially from that of other American preparatory schools. 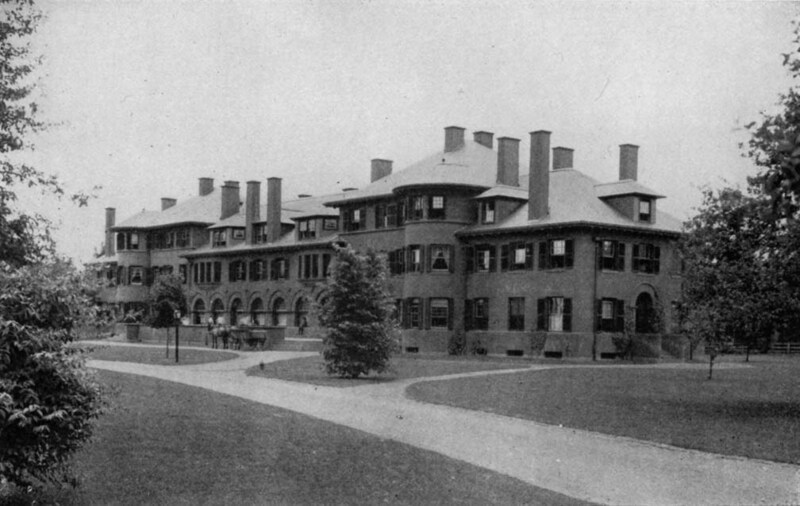 In it were incorporated the English "house" plan for sheltering and providing a home for the boys, and the New England academy educational model. As an experiment it was sufficiently novel to satisfy more radical minds, while on the educational side it appeared conservative enough to attract the patronage of parents disposed to stand by an established order of things. Success is generally held to justify the wisdom of an experiment, and Lawrenceville, on its new basis, was a success from the beginning. 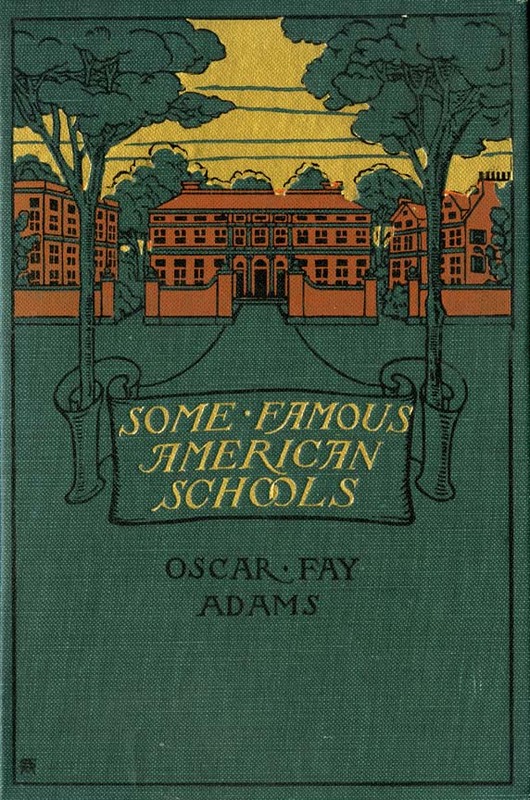 Its house system, so novel a feature in American preparatory schools, offered an amount of home life unattainable in the large dormitories so common elsewhere, and appeared to give equal satisfaction to parents and pupils. At the time of the establishment of the new régime in 1884, the equipment of the institution was composed of a large recitation-hall, with study-rooms, library, and auditorium attached; six houses for the masters and the boys under their especial charge; a private residence for the head master; bath-house; power-house; and laundry; an array of structures constituting almost a small village in themselves. If this were the case nearly twenty years ago it is even more so at present, for with increasing numbers other buildings have been added to the large original group ---the long and spacious Upper House in 1892, the Edith Memorial Chapel in 1895, the Lodge, and several lesser buildings at a somewhat later date, and the great gymnasium in 1902. Nearly all the principal buildings are ranged about the long oval lawn already mentioned; the gymnasium, and others to be erected at some time in the future, will occupy similar topographical relations to a second oval, the two then somewhat resembling in outline a figure eight. In an institution containing some four hundred boys it might seem as if the individuality of each would be lost in the mass, but at Lawrenceville this appears far from being the case. Indeed, the system of separate households directly fosters individuality. Loyalty to the school as a whole abounds, but class feeling is weak, while house feeling is strong, and this state of things is encouraged by the governing authorities. There will be time enough for the development of a class spirit in the university, it is urged, but in the school the more restricted range of feeling is desirable. There is consequently no playing of games nor athletic contests between forms or classes, but much rivalry between teams belonging to separate houses. Except the members of the fourth form, all the boys are required to live in the masters' houses, five of which are within the main grounds looking out upon the campus, and six are in the immediate vicinity. The number of boys in any house varies from seven to thirty-two, and when it exceeds sixteen the labours of the resident master and his wife are lightened by the presence of an assistant master. Probably if the annals of each house were minutely written there would occur records of minor rebellions and insubordinations, and no sensible person would give a copper for any assemblage of boys of which this would not be true, but in the long run the life in each house is just such a healthy, spirited, juvenile existence as it ought to be, not perhaps offering a perfect substitute for the life of an ideal home, but preferable in many respects to that of the average household. It was the writer's privilege on one Sunday evening to visit one of the Lawrenceville "houses" just as the boys living there had gathered for their customary Sunday night "sing." A piano stood in the spacious hall, and around it were grouped several of the boys, while many more were sitting on the stairs and the landings. The resident master stood beside the musician at the piano, and the master's wife had seated herself with one or two of the smaller lads on a sofa near the stair foot. It was a homelike scene, and unless appearances on that occasion were more than usually deceptive, the boys were enjoying the half-hour of song with just the same keenness that they would have done at home. If this particular school house were not home, it was certainly an extremely good substitute for it, an unprejudiced person would have said. Glimpses of the life in the other houses afforded evidence that this particular one was not exceptional in its home atmosphere. A MASTER'S HOUSE. LAWRENCEVJLLE SCHOOL. Far back in the writer's memory linger recollections of certain religious school services to which he went very much in the spirit of the quarry slave scourged to his dungeon, but as he watched the Lawrenceville lads trooping into their school chapel through various doorways it seemed to him as if they came because they liked to come, astonishing as such an assertion in regard to boys may seem. It is very true that their attendance was not a matter left to their decision, but there was no indication in manner or behaviour that attendance was looked upon as a hardship. Nor need it have been, by any boy in his senses. There was a short service, including the singing of two spirited hymns, and this was followed by a brief discourse of a practical nature, from the head master, perfectly well adapted to the comprehension of his hearers. The organ was superbly played, and the choir of forty boys seated in the apse showed the results of careful training. 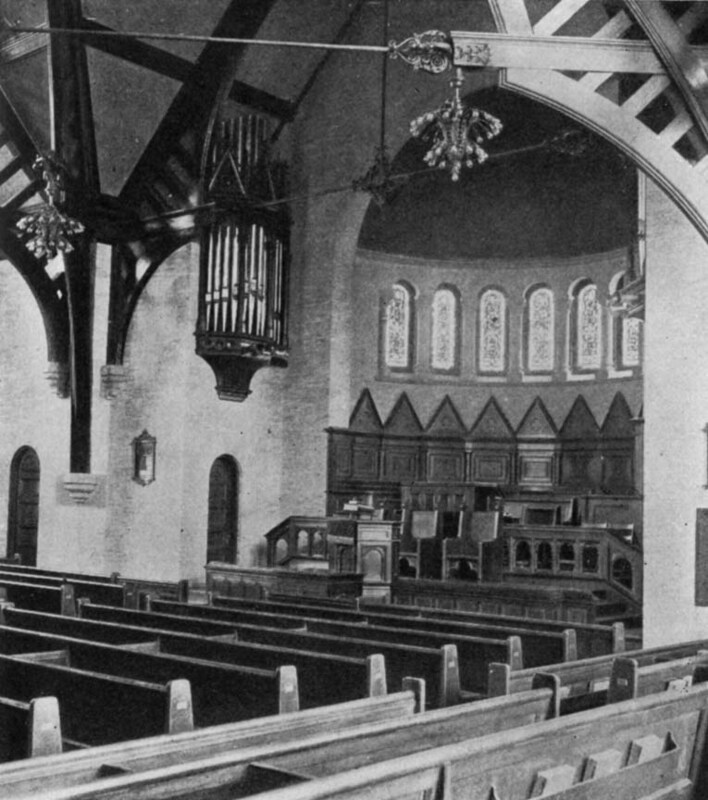 Whatever chapel attendance may have been at Lawrenceville in remoter periods of its history, it is hard to believe that any one regards it as irksome in the twentieth century. The household system as exemplified at Lawrenceville is so interesting in itself that one is tempted to dwell upon it at length, to the exclusion of other matters, but it should be said in this connection that nowhere else in the United States can it be observed to so full advantage, since at no other school is it carried out on so large a scale. Whether or not it is an ideal one is not within the province of the writer to declare, but it has certainly produced the most admirable results at Lawrenceville. When the building known as the Upper House was erected in 1892, the original intention of the founders was brought to fulfilment, which was to allow the members of the fourth or highest form to live in one building by themselves, and with more personal freedom than in the masters' houses. It does not follow from this that the general school laws become inoperative here, but the government of this house differs from that of the others in being somewhat of the nature of a republic, and in its tendency preparing the boys for the larger freedom of college life. Two masters and seventy-six boys have their home here, the domestic life being controlled by a matron, while the government is vested in a board of seven directors elected semiannually from among the residents of the house. The same arrangement holds true of Hamill House, accommodating thirty fourth form boys for whom there was no room in the Upper House. More than one American school has copied this feature of the Upper House, a very practical recognition of the excellence of the Lawrenceville plan. While My Lady Nicotine is worshipped in more or less secret session in many a school and college, her worship, though not precisely encouraged at Lawrenceville, is nevertheless recognized to a certain extent. The authorities, convinced that gracious concession in part oftentimes accomplishes much more than Spartan prohibition, reversed their former policy in 1900 and provided smoking-rooms in the Upper House in which members of the senior form who had received a written permission from home to this effect, might smoke cigars and pipes, but not cigarettes. Smoking is, however, prohibited elsewhere in the building, and within the grounds, and each boy who smokes pledges himself to smoke in moderation, as well as to exert his influence to prevent the younger members of the school from smoking. One cannot help feeling that the Lawrenceville authorities have been wise in forbearing to attempt the impossible in the matter of tobacco, and that the wisdom of the serpent appears, to a judicious extent, of course, in their having thus tactfully secured the support of the older members of the school in controlling the younger ones in this regard. From an architectural standpoint the Lawrenceville structures have in several instances not a little to recommend them. The masters' houses are irregularly shaped but effective masses of red brick; the Upper House, of the same material, with its long façade, its assemblage of roofs, and its clustering chimneys, is distinctly a building upon which the eye may rest with pleasure. Memorial Hall, a Romanesque structure of red sandstone in the Richardsonian manner, but with less of exaggeration than Richardson himself was wont to display, contains the recitation-rooms and study-halls, and rises from out the greensward between the Upper House and the Edith Chapel with all the massiveness of a Norman fortress. EDITH MEMORIAL CHAPEL, LAWRENCEVILLE SCHOOL. The chapel, just beyond it, is a less happy creation of the architect, so far as its exterior is concerned. It is in memory of John Cleve Green's daughter Edith, who died in infancy, and is a cruciform structure of red sandstone with a spired tower in the angle formed by the nave and south transept. 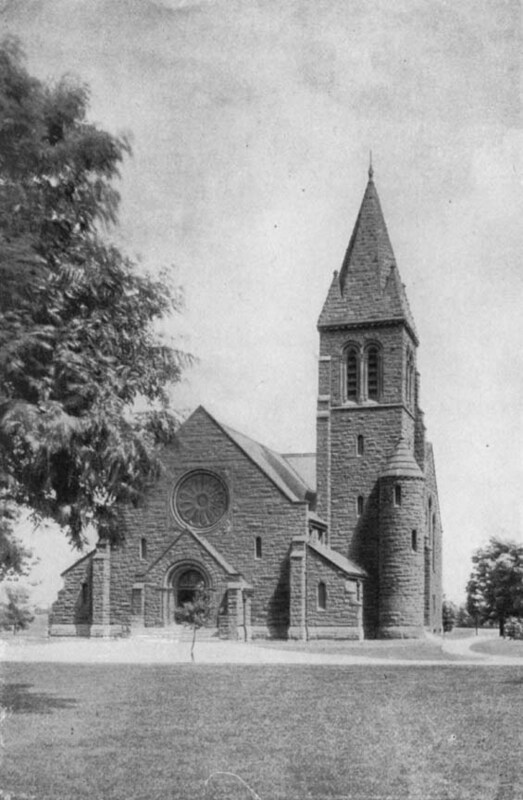 But the width is too great for the height, a common fault in modern American churches, and the short, octagonal spire, with its broaches, is a chronological impertinence upon a Romanesque edifice, since Romanesque builders employed pyramidal rather than octagonal cappings for their towers. The western doorway is ineffective, and the buttresses are of a character which would not be immediately recognized by Norman builders. But the interior is both beautiful and impressive. The majestic sweep of the many-windowed apse is a feature that immediately takes the eye, while the nave aisles, which serve as ambulatories merely, have a character about them reminding the observer of similar details in the Norman art of Sicily. Differing very widely from any other structure upon the grounds is the gymnasium, completed in 1902, and standing on the upper side of what will eventually be the second circle or oval. This athletic temple, as it may be called, is of yellow brick and white terra cotta, the latter material employed much too profusely for decorative purposes, a temptation seemingly inseparable from its use at all. It consists of a long central portion with a high basement, and wings set well back at the sides. Among its attractions are a swimming-pool seventy-five feet long, bowling-alleys, running-track, and innumerable individual lockers separately heated and ventilated. To the uninitiated one modern gymnasium, if not as much like another as is my fingers to my fingers, is yet in effect a replica of it, but since the Lawrenceville people confidently declare that their gymnasium has apparently no equal in any American school, one must believe them, since it would be well-nigh impossible for the non-professional person to undertake to establish the contrary. One thing, at least, is certain, it would be a most exacting athlete who could desire more for his physical development than is to be found here. The gymnasium holds a conspicuous place in the life of the school, every pupil being required to exercise a certain number of hours a week within it, and swimming, boxing, bowling, wrestling, are encouraged, while individual championship contests are held weekly. To look as if they grew there." No such Gradgrind system prevails at Lawrenceville. The nearly three hundred acres belonging to the institution give ample space for out-of-door games in their season. Ten graded playing-fields for football and baseball, twenty clay tennis courts, and two nine-hole golf courses are some of the resources that help to mitigate the rigours of scholastic life in this particular spot, and it is fair to presume that they are duly made use of. Indeed, every boy is obliged to select some description of sport and play regularly at it throughout the season. No great hardship in the most of instances it may be imagined. Five silver cups have been given by the alumni for the house championships in baseball, football, and track athletics, and the final games played by the houses settle the question as to which is the best team for the year. Lacrosse was a favourite sport at the school till 1890, and hockey is played in the winter on the school pond. Since 1892 representatives of Lawrenceville have won nine of the interscholastic tennis tournaments at Princeton, and have carried off three cups. The school teams in football and baseball won three out of six football games, and two out of seven baseball games in contests with Phillips Andover from 1893 to 1899. Since the last-named year the Hill School at Pottstown, Pennsylvania, has been the principal competitor of the school in athletic contests. On the purely scholastic side of life at Lawrenceville, one need touch but lightly here, for the reason that detailed descriptions of educational methods does not come within the scope of this book. Until 1902 the two courses of instruction, classical and scientific, each covering four years of study, was the order, when a five-year course was substituted, a change that not only enables some younger lads to enter, but provides a fuller and more satisfactory schedule of study. The members of the three lower forms prepare their lessons in the study-rooms in the Memorial Hall, but those of the two upper forms are permitted to study in their own rooms, a privilege no doubt fully appreciated by those who enjoy it, and ardently anticipated by those who view it through the vista of one or more years. Each master's house has its own reading-room, stocked with periodicals and papers, while the school library of five thousand volumes finds harbourage in one of the rooms of Memorial Hall. The two literary societies meet for debate on Wednesday evenings, and once a year there is a joint debate between them. A hall for their common use, and a library building are among the structures that Lawrenceville hopes ere long to see facing the second circle in its grounds. On successive Saturday evenings the whole school assembles in the auditorium of Memorial Hall to listen to a lecture, concert, or other entertainment, and as both Wednesdays and Saturdays are half-holidays, it will be seen that the burden of study is not suffered to rest too long at a time on the shoulders of these young seekers after knowledge. ENTRANCE TO MEMORIAL HALL, LAWRENCEVILLE SCHOOL. There are two Sunday services in the school chapel, at both of which the singing is furnished by a well-trained choir of forty boys, and with the present trend toward the common-sense details of ritual one may anticipate a day not so far distant when these boys will be vested for chapel services as are choirs of distinctively "church" schools at present. Music at Lawrenceville does not end with the training for the choir, for there are more secular musical organizations, such as banjo, mandolin, and glee clubs, and the school orchestra, and at stated seasons concerts are given by these various associations. The school has never lacked for either song writers or composers, and of all the various songs in the school song-book, the following is accepted as the distinctive school song. Who wears the Black and Red! And the heart that rules with the head! For the old school's name here's lasting fame! To the end of days may she flourish still! It is not a faultless literary composition, and some of the lines have in them more feet than the verses will bear, but it has the note of sincerity, and when this is present, grammar and rhetoric are, if not things of naught, at least matters of lesser importance. And if one is still disposed to be critical, it is well to remember how few popular songs commend themselves to the lovers of style in literature. Our young barbarians all at play are responsible in these later decades for the invention of certain heathenish combinations of words and syllables by means of which to express in unison the intensity of their feelings in moments of great excitement, which it pleases them to call cheers, but which maturer persons denominate Indian yells. Lawrenceville in this respect is no whit behind other educational institutions, as the accompanying "school cheer" bears witness. Like the small boy in one of Miss Alcott's tales who had manufactured the interesting expletive "Thunder turtles," and was very proud of the achievement, the Law:renceville boys appear equally enamoured of their success in the manufacture of "cheers" and have evolved various class cheers that do equal credit to their ingenuity if to nothing else, but the reader is mercifully spared their recital here. As is very well known, certain English public schools have developed in the lapse of time a local vocabulary, familiarity with which betrays the place of their training as unerringly as the speech of the Cockney bewrayeth him, though far from the sound of Bow Bells. Lawrenceville, modern as it is compared with Winchester or Eton, has yet a few words of its own, as well as a few which it shares with some other schools. "Jigger" is one of these terms, and denotes a certain quantity of ice-cream served out at the local "jigger shop," while a "double-jigger" is a double quantity of this enticing viand. "Shag" is a term employed to signify the going around the school circle to work off house marks for tardiness, etc. The non-scholastic mind would probably be at a loss to unravel the meaning of the elegant expression "hot dog," but Lawrenceville usage applies it to the boy who, while doing something out of the ordinary way, however excellently, conveys the impression at the same time that there is something of the nature of the "swelled head" about it. FOUNDATION HOUSE, RESIDENCE OF THE HEAD MASTER, LAWRENCEVILLE SCHOOL. Under its present foundation Lawrenceville has had but two head masters. The first one, the Reverend James Cameron Mackenzie, was in charge of the school from 1882 until 1899, and to him is due the educational and domestic policy of the institution. An able teacher, and a masterly disciplinarian, the school prospered under him, but he seems never to have gained the hearty affection of either masters or pupils. He was succeeded by the Reverend Simon John McPherson, D. D., who from 1882 had been pastor of the Second Presbyterian Church in Chicago. He is still in the prime of life, having been born in 1850, and under his open-minded, optimistic sway Lawrenceville is unlikely to go backward. As these great middle schools of America become more generally recognized as holding a legitimate place in the national life, we may expect that literary associations will cluster about them as around Rugby, Harrow, or Winchester. Lawrenceville has not yet appeared in what may be called serious fiction, but in "Tommy Remington's Battle," a story published in the Saint Nicholas Magazine for November, 1901, several chapters are devoted to the account of a boy's life at Lawrenceville School, chapters, by the way, that are full of life and spirit. Something of the atmosphere of the place makes itself quickly apparent in them to one who knows the life they touch upon. But if as yet the literary world knows little of Lawrenceville, the school has what may be called a literary life of its own, for in addition to the two literary societies, the Calliopean, founded in 1818, and the Philomathean, dating from 1855, there are the school's four publication, --- the Olla-Podrida, an annual whose contents strictly carry out the implication of its name; The Lawrenceville Literary Magazine, a monthly established in 1895; the Y. M. C. A. Handbook; and The Lawrence, a weekly newspaper appearing on Wednesdays. It is edited by a board of members chosen from the fourth form. Unwritten laws there are at Lawrenceville, as at other schools, but none the less binding on that account, for unformulated tradition often holds when constitutions part. It is nowhere nominated in the bond that the new boy, however he may excel in this or that, shall be reticent in regard to his excellencies, letting them appear as if they had silently stolen upon him without his knowledge, but such is the custom, nevertheless, and the sooner the new boy perceives it the better for his happiness. Nor is he expected to don the school colours of black and red until he has completed one full term, at the end of which period his worthiness to do so is no doubt demonstrated more or less clearly. The school initial "L" is awarded to all those who play in the final championship games of school sports, and the house initial to any boy who makes the house team in any sport. The Lawrenceville boy who should fail to lift his hat to any master who had recognized him would be speedily sent to Coventry by his comrades, and the same spirit of courtesy keeps him perfectly quiet during the dullest of lectures or entertainments, as well as prompts him to give the school cheer to those who have afforded him pleasure on any occasion when the school is gathered in the main hall, or auditorium, as it is called, of the school. Athletic victories are emphasized by bonfires on the following evening, and by visits to the various houses to listen to speeches by the masters. Officers and captains of teams are chosen because of their proven ability, and not because of their popularity. Still other customs there are that may be touched upon, which cannot fail to commend themselves. In the Mercer Hospital at Trenton is a Lawrenceville Room, and to its support the members of the school contribute liberally. Some seven hundred dollars are annually raised for the support of the school summer camp near Huntington, Long Island, where during the summer season thirty or more poor boys from New York City are given a two weeks' outing. The city lads are taken thither in companies of ten or twelve at a time, and several of the Lawrenceville students volunteer their services in helping the leader or supervisor in managing the camp and directing the amusements and exercises of its members. This wholesome charity is carried on wholly by the freewill offerings of the students, and its beneficent effects are not experienced by its immediate objects alone. Almost two decades have slipped away since the present system was established at Lawrenceville, and within that period its efficiency has been amply tested. For a smaller school, where the number does not greatly exceed one hundred, it may very well be that the Saint Mark's plan of gathering its entire number beneath one roof for all its exercises may be the wisest, and where the numbers are greater local considerations may still determine decision in favour of the more usual American dormitory plan. All that Lawrenceville would probably claim is that its separate house system had worked admirably in its own case, and that possibly it might be equally effective, with the necessary local modifications, elsewhere. In any case, the Lawrericeville plan offers much of interest to the observer and its workings deserve the careful attention of all who are interested in the educational problem which our great middle schools are doing their best to solve in their various ways. Incorporated, June 29, 1855; opened, April 3, 1856. Founder, George Cheyne Shattuck; first rector, Reverend Henry Augustus Coit, 1856-1895. School divided into six forms and an upper remove. Course of instruction covers six years. Thirty-nine masters; 350 pupils. No boy admitted who is over sixteen. School year begins in September, ends in June; three weeks' vacation in winter, two weeks in spring. School controlled by board of trustees, who by terms of founder's deed are communicants of the Protestant Episcopal Church. Sixty buildings belonging to school. Library of 13,000 volumes. Literary societies: Cadmean, Concordian. School Journal, Hor Scholastic, founded 1860 and issued monthly. Scientific Association. Banjo, Mandolin, and Glee Clubs. Racquet courts, fives courts, cricket grounds, golf links. Six rowing crews; nine scholarships; two prize funds. Alumni Association formed in 1869, and composed of persons "who have left the school in good standing and who signify their desire to become members." School motto: "Maxima debetur puero reverentia." THE famous school at Concord, New Hampshire, which for nearly fifty years has borne the name of the apostle Paul, was not the earliest American school to bear it. The Flushing Institute on Long Island, starting as a boys' boarding-school in 1828, had become in ten years' time Saint Paul's College, for eighteen years owned and controlled by Reverend William Augustus Muhlenberg, of happy memory. Doctor Muhlenberg's theory of a school was that of a family, and he managed Saint Paul's College on this principle. Whether or not the head of a school should stand in loco parentis to his pupils may, perhaps, be open to debate, but it is not a question to concern us here. In what it attempted, Saint Paul's College was a success, and many an American school was modelled upon its example, the college of Saint James, at Hagerstown, Maryland, being one of the most important of these earlier copies. "The founder is desirous of endowing a school of the highest class for boys, in which they may obtain an education which shall fit them either for college or business, including thorough intellectual training in the various branches of learning; gymnastics and manly exercises adapted to preserve health and strengthen the physical condition; such æsthetic culture and accomplishments as shall tend to refine the manners and elevate the taste, together with careful moral and religious instruction." It may be urged that the details of this design are anticipated in the Andover "constitution," wherein the especial purpose of that institution is "to learn them THE GREAT END AND REAL BUSINESS OF LIVING," and in the Exeter "constitution" in the clause relating to "such other of the Liberal Arts and Sciences or Languages as opportunity may hereafter permit," but neither of these documents, unless interpreted in a spirit calculated to reduce the original founders to a state of speechless dismay, precisely parallels the provisions of the founder's deed to Saint Paul's. Certainly to the equal emphasis upon physical culture and study in the later instrument, the eighteenth-century documents not only afford no parallel, but those who prepared them could not have conceived the possibility of such equality ever being contemplated. The earliest rector of Saint Paul's School was the Reverend Henry Augustus Coit, who had been trained for his life-work under Doctor Muhlenberg, and had been an instructor in the Hagerstown College. Whatever Saint Paul's is to-day, in organization, spirit, and ideals, is due to Doctor Coit, who was its head from 1856 until his death in 1895. Americans of that unreasonably conservative type (now fortunately becoming rare, and destined to become, let us hope, as extinct as the dodo), to whom the unusual is a deadly offence, have now and then objected to Saint Paul's and sister institutions, that their nomenclature and some of their customs were English rather than American. Saint Paul's people spoke of "forms" where patriotic Americans were contented to say "class; " they had "removes," whatever those mysteries might be; they played at cricket, and they attended matins and evensong. Wiser persons saw in these details only evidences of a wholesome individuality, and were very far from trying to discover in them a slavish imitation of English models. When all was said, "form" was at least quite as good a descriptive term as "class," and had the merit of long-established usage in its favour in this connection, and if it pleased the Saint Paul's people to adopt it and to play at cricket if they wished, why let them, to be sure. There was no reason in the nature of things why all American schools should resemble each other in organizations, speech, and customs as much as peas in a pod. Moreover, schools of the Saint Paul's type, being distinctively "church" schools, not unnaturally reflected to some small extent certain externals of the great English schools controlled by the Established Church. That they should not have done so would have been indeed a matter for surprise. Incidental reproduction of English usages was to be looked for, and if these usages chanced to be excellent in themselves, there was no occasion for mental excitement on the part of over-patriotic Americans. But Saint Paul's has successfully lived down the opposition, both active and passive, to which its establishment gave rise, and has proved its excellence in its especial field by nearly a half-century record of honourable achievement. But misconceptions regarding the work of any important school or other institution are apt to spring up, affecting more or less the attitude of outsiders in respect to it, and compelling its friends to devote much time to dispelling them. One may frequently hear, for example, that the Lawrenceville School has an endowment of five or ten million, the amount varies according to the imagination of the speaker, and it may very well be that a slight feeling of envy has been unconsciously aroused in the bosoms of the authorities of other schools who find themselves hampered in many ways by insufficient endowment. As a matter of fact this tale of Lawrenceville's exceeding affluence may be given as much credence, and no more, as the legend of the founding of Rome. It was generously endowed by its founders, but its income does not permit of any expenditure but the most well considered, and like many schools less well equipped, it is obliged to await the accumulation of funds when new enterprises are desired. Whatever prejudices there may once have been in certain quarters against Saint Paul's on the score of its being a "church" school, have long since vanished, but one cannot escape hearing the assertion made that Saint Paul's boys are kept so continuously in an atmosphere of church-going that when once emancipated from it, they determine to go to church thereafter as little as possible. No doubt that just this same declaration of ecclesiastical independence has been made now and then by Saint Paul's graduates, as it has been made by those from other schools, but it may be seriously questioned if it indicates the existence of any such general spirit. It is at least a supposable case that these ecclesiastical insurgents would have acted on the principle of abstention from church attendance if they had never heard of Saint Paul's. One thing, at least, is very clear to the writer, which is that whatever may have been the case in the earlier decades of the school's history, at present the flame of devotion in the juvenile bosom runs no risk of being extinguished by multiplicity of church services or weight of ritual. The boy who would seriously cavil at the present requirements at Saint Paul's in this regard would most probably object to any restraint at all upon his freedom of movement. It is quite conceivable that a boy might not like to attend church; it is much less likely that he would regard the amount of attendance required of him at Saint Paul's in the light of a hardship. It is not so very long ago that the writer passed a Sunday at Saint Paul's. At half-past eleven in the morning there was a service in the school chapel lasting not much over an hour, and at half-past three came the service of evensong, measurably shorter. No doubt the far-off Puritan ancestors of these lads, who shivered in fireless meeting-houses while they hearkened to sermons of interminable length, and incomprehensible substance, would have been decorously thankful in their childhood to have been able to exchange their Sabbatarian experiences for the abbreviated services in the chapel of Saint Paul's. Two miles west of the Main Street of the city of Concord, New Hampshire, the Dunbarton highway makes a gradual descent to the valley of the Turkey River, where nearly two centuries ago the stream was widened into a pond by the construction of a dam to serve the needs of a saw-mill and a gristmill. The district had been known as the Lower Mills for some length of time, and there were a few houses in the vicinity when Doctor Shattuck, whose summer residence it had been, conceived the idea of founding a school here. For its purposes the site of the school was not ill chosen. The valley is irregular in shape, its windings affording considerable variety of outline and offering advantages in the way of building sites which a more level territory would have lacked. A half-century ago, besides the mills, the brick house of the founder, a small district school, and a farmhouse or two, there were no other buildings at this point on the Dunbarton road. Now the sixty buildings great and small, connected with the school, with several others not belonging to it, constitute a goodly village in themselves. From the eastern boundaries of the school property, where the highway begins its leisurely descent, there is a somewhat extended prospect to southward, but as one goes westward, the views, though sufficiently pleasing, are circumscribed. 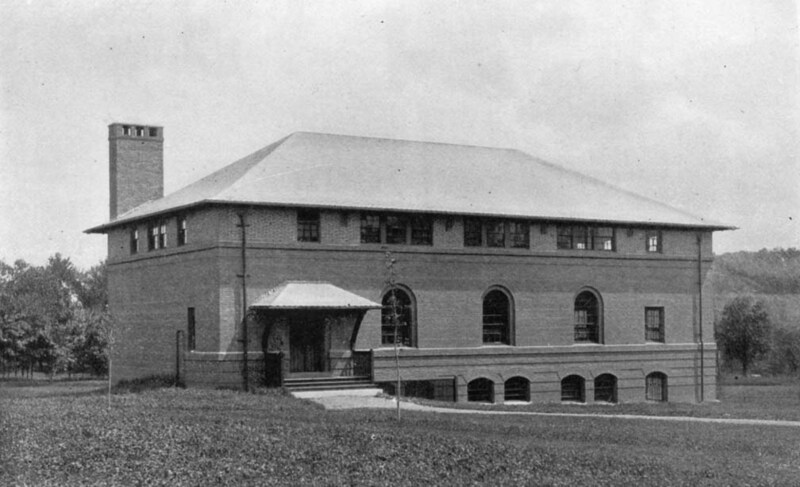 The first building of Saint Paul's passed in going in this direction is the Alumni Hall, a spacious structure, exceedingly attractive as to its interior, erected in very recent years, as a house of entertainment for visiting alumni and other guests, and the last is the immense Upper School now (1903) building, on the rising ground above the river on its western side, the distance between the two being at least a third of a mile. The grounds attached to the institution comprise about two thousand acres of woodland, farmland, and water area, and infinite possibilities in the way of playing-fields are here, needing only the expenditure of large sums to render them available. Not that much has not already been done in this direction, as the visitor soon discovers when some loyal son of Saint Paul's has piloted him about from one field to another and sedulously pointed out all their many excellencies from the athletic point of view, but the capabilities are even more interesting, and one cannot help anticipating the time when, through the generosity of loyal alumni, they will be utilized to their full extent. Architecturally Saint Paul's offers less of interest as a whole than Groton or Lawrenceville, or perhaps Saint Mark's. It is less showy than Shattuck with its huge stone tower, less picturesque, it may be, than Belmont. But Saint Paul's was a gradual evolution from a small beginning. There was no thought of architecture in anybody's mind when it was founded. Americans who knew or cared anything at all about architecture in the fifties were almost as scarce as hens' teeth, and what they thought about it in the sixties or early seventies was seldom worth much, and in the majority of cases had better never have been thought at all. But while Saint Paul's as a whole is less interesting architecturally than Groton or Lawrenceville, or several middle schools of even later date, this is not to say that architecture, as architects understand it, is not represented here. Overlooking the river just above the dam is the new library building given to the school and designed by the well-knows architect, Ernest Flagg. It is of white granite, roofed with the reddest of tiles, and its exterior is disappointing, despite the really fine entrance portico. It impresses the beholder as startlingly new, and not for another generation will it take on that air of repose which a library, of all structures, should possess. 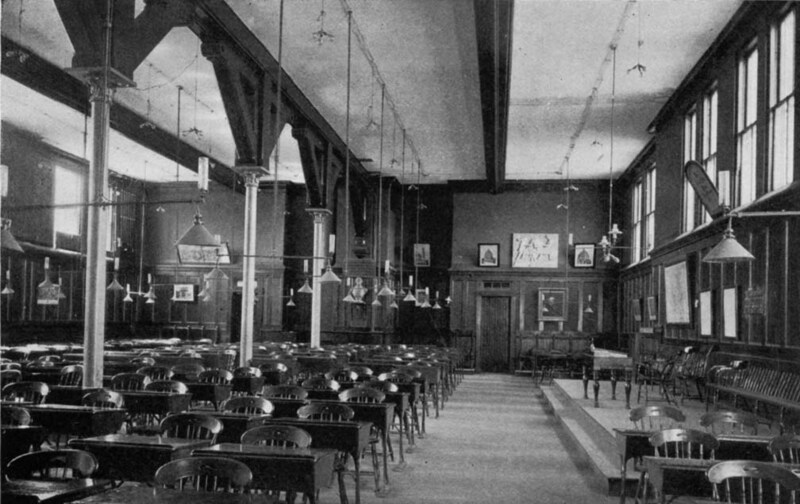 But the interior seems admirably adapted for the purposes of a comparatively small school library---an octagonal central reading-room, lighted from a dome, and easily converted into an effective lecture-hall by the removal of its furniture, and, circling about it, the several departments of the library proper. The great building in process of erection on the slope west of the river was too much obscured by scaffolding to be seen to advantage at the time of the writer's visit, but it is a very distinctive advance upon all the buildings which preceded it, with a single exception, the chapel, and its irregular outline is a merit in itself. One of its especial features is a lofty and spacious dining-hall. Whether the rather pale brick of which it is built will ever assume the mellow hue which lends so great a charm to certain century-old houses in Mount Vernon Street, in Boston, only future generations will know for a certainty, but the probabilities are that it will not. The single exception noted in the preceding paragraph is one of extreme importance, however, for at the time of its erection in 1888, it was surpassed in excellence by no school or college chapel in the United States. 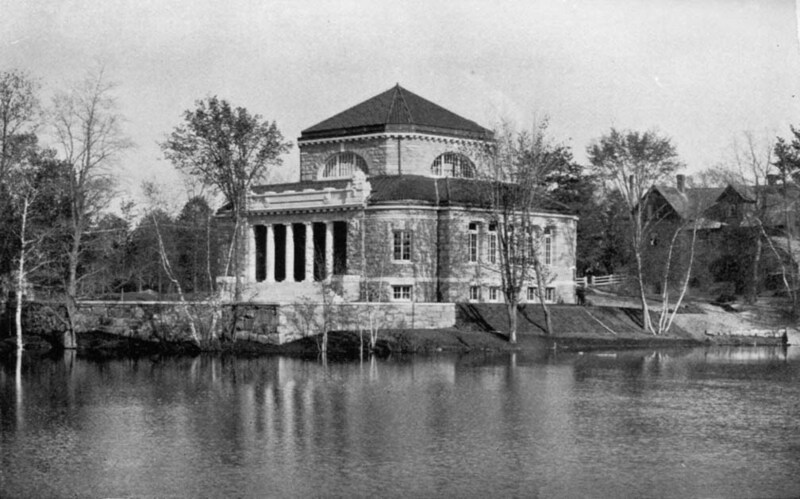 Thirty years earlier Bowdoin College had erected a chapel whose interior followed in its general lines the usual design of such structures at English colleges. It was lofty as well as long and narrow, and it was for a long time the best building of its kind at any American college. It was an object-lesson, so far as its interior was concerned, in college chapel construction, but one that unfortunately was far too little heeded. CHAPEL, SOUTH SIDE, SAINT PAUL'S. The chapel at Saint Paul's follows much more closely than that at Bowdoin the English type of college chapel, its interior resembling more nearly that of the chapel of Marlborough College, than any other. It was designed by the Boston architect, Henry Vaughan, and the style adopted is that of the Curvilinear development of the Middle Pointed, or Decorated style. It is of red brick and red sandstone, and its outline includes a nave and ante-chapel with west tower and what from its position may be called a tower transept, and a constructional choir with organ chamber. The entire length is one hundred and fifty feet, and the apex of the ceiling is fifty feet above the floor. A lofty reredos of carved oak, the gift of Cornelius Vanderbilt in memory of his son William Henry, who died in 1892, is the most conspicuous feature of the choir. With its gilding and colours it is at present a little too obtrusive to be altogether pleasing, but when age has darkened the woodwork the general effect will be improved. Carved stone sedilia are placed on the south side of the sanctuary, and on the north side is the recumbent marble statue of the school's first rector, Reverend Henry Augustus Coit. High above the choir stalls on the south side is the organ. 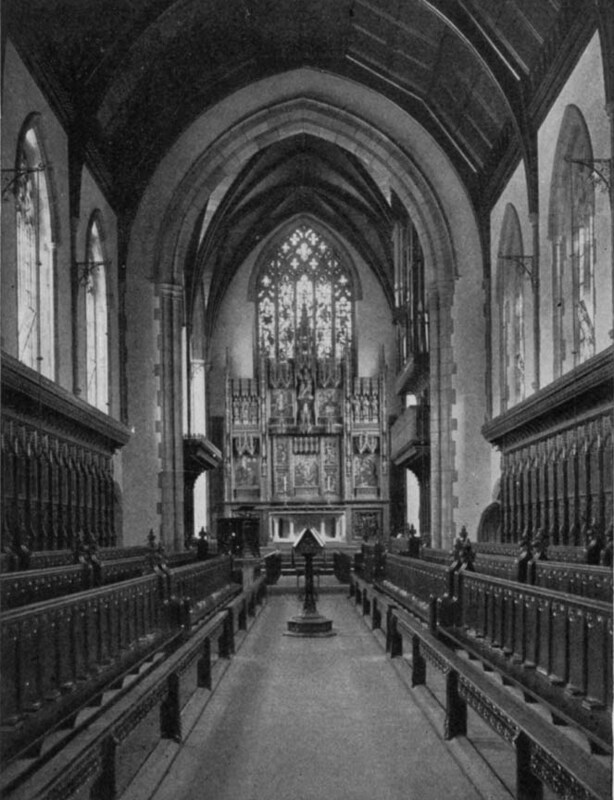 The seats in the nave face each other across the aisle, and a row of oaken stalls lines the walls behind them on each side. A carved oak screen with gates divides the nave from the ante-chapel, and above it is a small gallery. The stone tracery of the windows of nave and choir is of good design, but the stained glass which fills the most of them need not excite in the beholder any particular enthusiasm. That in the heading of the great east window is the most effective. Deeper, richer colours might have been used to greater advantage, while the introduction of so many figures as are here represented hardly commends itself. But the subject of modern stained glass is a dangerous one, to be carefully avoided by him who would live peaceably with his neighbours. 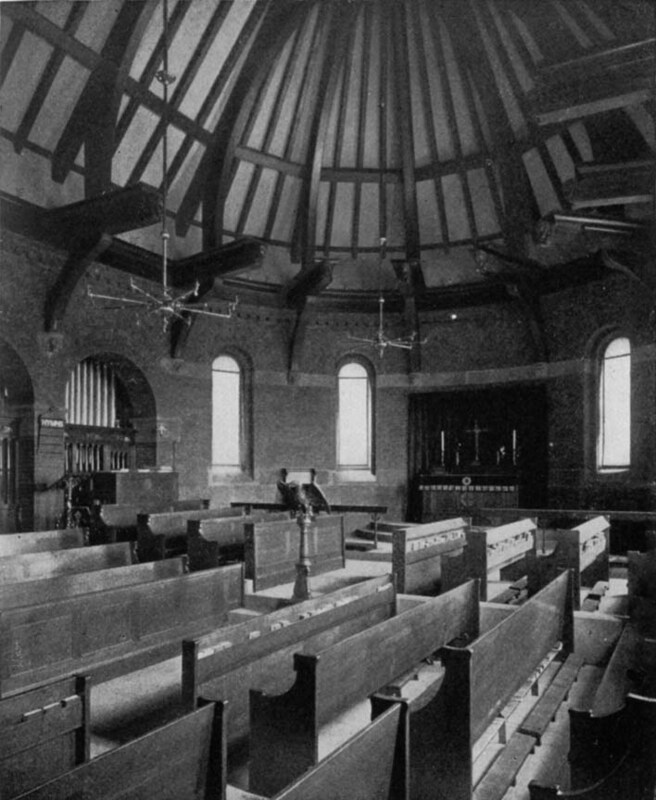 INTERIOR OF CHAPEL, SAINT PAUL'S, LOOKING EAST. As the writer looked down from his seat above the ante-chapel screen, upon Saint Paul's three hundred and fifty boys, it seemed to him, as to his companion, that the type represented was of a slightly more intellectual character than that to be traced at Lawrenceville, although at the latter school the type is distinctly higher than it was a decade ago. It may have been purely a matter of fancy with the two observers in the gallery of Saint Paul's, but it was a fancy they shared in common, and they likewise agreed in thinking the type observable at Exeter indicated a finer strain than that at Andover, but here again they would not wish to dogmatize, and if mistaken are very willing to be convinced of the fact. If, however, the differences apparently noted do really exist, the causes may be easily traced to their legitimate source, --- original environment of the majority of the lads, in each school, their ancestry, their local training. The Saint Paul boys, in physique, resemble more nearly the boys at some such English school as Winchester, rather than their compatriots at Lawrenceville, Andover, or Shattuck. In other words, they are slighter, less stocky, as one may say, than the generality of American boys of the same class. It is the common impression that English lads are much stouter in build than American, but however true this may have been at one time, it is not true at present, in the writer's opinion, founded upon observations in both England and the United States. Next to its scholarship Saint Paul's prides itself upon its prowess in rowing, possibly even more, in the opinion of undergraduates. Be this as it may, interest in rowing was awakened in the earliest days of the school's history, and a generation ago this was greatly quickened by the formation of the Shattuck and Halcyon rowing clubs in 1871. Not a few famous oarsmen of the past in American universities and colleges had their earliest training on Long Pond, a sheet of water two miles to the northwest of the school. How dear to the heart of the Saint Paul students is this particular form of sport is shown by the presence of the rowing-tank in the school gymnasium, a building completed in 1879. After rowing, cricket comes next in favour here, and indeed is reckoned as especially the school game, since from the nature of things rowing is a sport in which but a limited number of the school can indulge. The founder brought with him from England in 1857 a cricket outfit, and the earliest cricket clubs were started in 1859. The cricket clubs of the present day contest for challenge cups given to the school from time to time for this purpose. 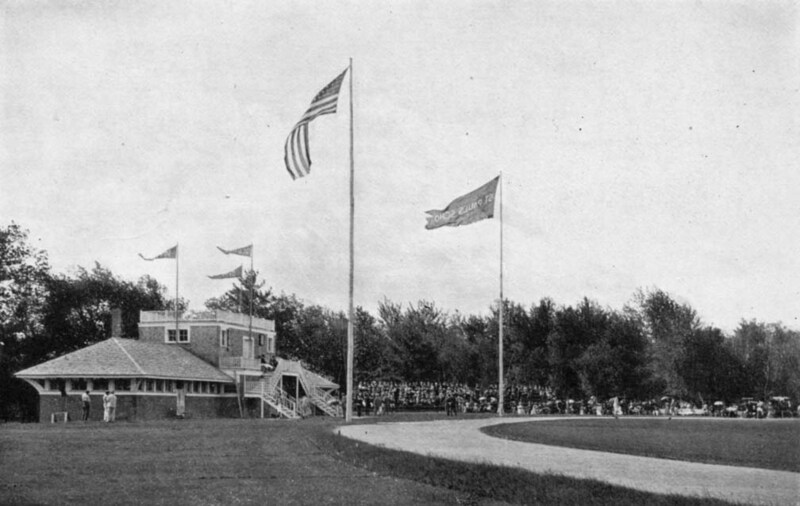 The first cricket-house was built in 1880, but was removed in 1893, its site being occupied by the present Athletic House. Racquet courts were added to the attractions of Saint Paul's in 1882, and the Fives Courts of the Lower School were the popular novelty of 1896. CLUB HOUSE, LOWER GROUNDS, SAINT PAUL'S. A level stretch of turf to the south of the school, below which winds the Turkey River, is known to Saint Paul's men as the "Lower Grounds." It is an exceptionally pleasant spot, nearly if not quite surrounded by a line of white birches whose pale, slender trunks gleam out among the leaves, but it is not to be supposed that its natural beauty appeals to enthusiastic schoolboys when an exciting game is on. These grounds include a running track, football fields, and tennis courts and the Athletic House, already mentioned. Golf links there are in the western limits of the school property, and whatever else is needful for the physical culture of the sons of Saint Paul's, it is fair to presume that they have, since it is not the policy of the school to stint in this direction. Owing to the extent of territory occupied by the various buildings of the school, one does not at first realize its importance so far as size is concerned, or receive that impression of the omnipresent boy which is so often gained at much smaller schools where the buildings are more compactly clustered. It is only after one has moved in diagonals from one portion of the estate to another, that the full scope of the institution begins to make itself felt, nor is the number of students appreciated till one has come upon them precipitating themselves en masse from schoolroom or gymnasium. And if one chances to meet them filing along the walk between the chapel and the Lower School, for instance, he will be ready to declare that instead of three hundred and fifty there are nearer three thousand. What Saint Paul's loses in architectural effect from the scattered character of its many buildings and the hopelessly uninteresting exterior of some of them, is more than made up in the minds of many observers, at least, in the picturesqueness afforded by their apparently haphazard disposition, and the historic evidence of growth from small things, an impression certainly not received at Groton or Lawrenceville, even although the latter school in its Hamill House possesses a fabric older than anything at Saint Paul's, but which, as it does not form a portion of the general architectural scheme, may be overlooked in considering the impression obtained of the whole. Those who have watched from one decade to another the gradual development of the Concord school, from what is playfully termed its "Saxon period" to the present, would hardly be willing to exchange its architectural equipment, into which the history of the school is inextricably interwoven, for the stateliness of Lawrenceville's modern grouping, Groton's air of youthful newness, or Belmont's atmosphere of completeness. To each its own. In the lapse of years the newest of the schools and the most recent of its buildings will gradually assume the aspect of dignified maturity that is oftentimes considered so desirable in things scholastic, while the older ones will pass into the catalogue of things venerable unless iconoclasts arise with a mania for having everything "up-to-date," to employ the atrocious slang of the period. Despite its half-century record Saint Paul's has seen but little change in its headship. Its first rector, Doctor Henry Coit, lived to see the school, with its original three pupils, to which he came in April, 1856, become the great institution of to-day, known far and wide throughout the United States, with its graduates scattered along almost every walk of American life, and its single building multiplied sixty-fold. He died February fifth, 1895, and Saint Paul's chapel not only contains his recumbent statue, already mentioned, but a memorial window to him above its entrance. Statue and painted pane, these are the conventional memorials of this great American teacher, but the actual memorial is in part the school to whose welfare he devoted the labour of forty years, and in part --- and by far the larger part ---the hundreds of American lives which have felt the impress of his strong, Christian character, which are better fitted for the stress of living because of him. He might without doubt have worn the mitre had he so chosen, and prominent churches would have gladly had him to minister to them, but he was not to be persuaded to leave the work to which he had been so genuinely called. He was succeeded as rector by his brother, Dr. Joseph Howland Coit, who had been vice-rector since 1865, and to whom every school detail was thoroughly familiar. He has for some time been incapacitated by ill health from active duty, and during his absence in Europe at the present time (June, 1903), his younger brother, J. Milnor Coit, presides as acting rector. His labours are shared by forty resident masters. From the saintly Muhlenberg the first rector imbibed his loco parentis theory of school management, and upon this principle Saint Paul's has ever been conducted. It has undergone some minor modifications inseparable from changed conditions brought about by increasing numbers and alterations in customs, but in the main it continues dominant and its workings are apparent in many directions. The present acting rector is open-minded and disposed to consider the welfare of the school in preference to the maintenance of theories, but that any radical change will be made in the governing principle is unlikely. Saint Paul's success in the past has come about through its obedience to the Muhlenberg theory, and there appear at present no adequate reasons for reversing the policy of the last half century. On the face of things it might appear well-nigh impossible to carry into effect such a principle in dealing with between three and four hundred boys, and the writer is by no means able to explain how the impossible is attained in this particular instance, but that it is so attained he has very little doubt. Unceasing application, and a most careful disposition of time on the part of the governing authorities, are probably responsible for much of the success in this regard. In the earlier history of the school it is recorded that the rising bell rang at five in the morning, a custom happily passed into oblivion long since, for whatever may be the delights of that "untoward hour," as it may be styled, when the dew lies glittering over the grass and there is a faint prospect of meeting the rosy milking-maid of romance, continued observance of that hour for rising would make life anything but one grand, sweet song. Still, if one is obliged to do the work of several men in the time of one, there must be a striving after the heroic, and the acting rector of Saint Paul's, mindful, possibly, of the circumstance that, according to report, the Waverley novels were all written before breakfast, rises at six o'clock the year round, and begins the day by a visit to the school infirmary, the first of seven daily visits made by him to that adjunct of the institution when any of its beds are tenanted. Much can be accomplished, indeed, when one treads so closely as this upon Aurora's heels, or even precedes her at certain seasons of the year, and it is this same spirit, shown in a detail like this, which when carried out in many others doubtless makes it possible for the heads of a school to preserve an intimate knowledge of the boys entrusted to their care. The loco parentis principle as a working theory applied to the training of younger boys will no doubt be conceded by most persons to be the best, and in the majority of schools is really put in practice. When applied in the case of older pupils such as those in the upper forms, the desirability may, as was remarked on a previous page, be open to debate. In the university life it is very certain that no such theory can be successfully carried out, except in a very few details, and colleges which have attempted it have failed more or less completely in its enforcement. If self-reliance is ever to be acquired a beginning must be made in college, if one is not to enter the larger world all unprepared for its strife, and in the opinion of the heads of some preparatory schools the beginning may be made in the last year of school life, as a prelude to the fuller, freer life of college and university, and the still wider existence in the world at large. Local conditions have their due influence, however, and in a secluded locality like Saint Paul's a theory of school management may be advisable which at Lawrenceville, Exeter, or Andover would be in the main inexpedient. To each, again, its own. Saint Paul's has not figured in literature in any but the most casual way, so far as a locale for novel or poem is concerned, but it has sent out into the world not a few who have become famous in literature. The monthly school periodical, the Hor Scholatic, was established in June, 1860, and a search among its files would reveal the very earliest "efforts" (a happily descriptive term as applied to schoolboy effusions oftentimes) of the well-known novelists, Francis Marion Crawford, Owen Wister, and Winston Churchill. Other names there are of Saint Paul's boys also known to the literary world, such as those of Stephen Bonsal, William Roscoe Thayer, James Barnes, and John Jay Chapman, the essayist. As a preparation for work in the Hor Scholastic, a literary society called The Cadmean was formed in 1885, and a second one, The Concordian, in 1898. The Hor does not differ materially from other school periodicals. It is extremely well printed, shows care in editing, and is newsy, as such a publication should be. From its pages the outsider obtains a very fair notion of the current of school life, albeit certain allusions here and there might partake to him somewhat of the nature of Elusinean mysteries. But one expects that in school papers, as a matter of course. There is much at Saint Paul's upon which one might like to touch, but the details already mentioned are perhaps those the most likely to impress one seeing the institution for the first time. In general outlines the school work in the middle schools does not differ very much as one school is compared with another. Its details, except in the case of the professed student of educational systems, do not take strong hold of the memory. The visitor rémembers vaguely what was told him of the study customs of one school until he finds himself at another, and then his first vague notions are still further obscured by what he learns of similar details at the second. But certain matters, like position, buildings, manners, and customs, and whatever pertains to a school's individuality, the visitor does remember, and it is the ordinary observer's impressions of such as these that are here recorded in relation to Saint Paul's. Founded by Joseph Burnett in 1865. Under control of the Episcopal Church. Daily morning and evening prayers in school chapel. Sunday attendance at parish church. School year begins third Wednesday in September; ends last Wednesday in June. Christmas and Easter vacations. Prepares, for universities, colleges, and scientific schools. Six forms of one year each. Applicants for admission must be at least twelve years old. Fifteen masters. Board of trustees appoint a head master in whom the administration of the school is vested. The bishop of the diocese is visitor of the school. IN the midst of pleasing, though by no means striking scenery, a region of low, rounded hills, shallow valleys, and tilled farm lands banded by strips of woodland, the traveller through central Massachusetts, when half-way between Framingham and Marlborough, comes suddenly upon what appears like a group of many windowed and gabled structures standing on rising ground not far from the railway station in Southborough. But for the very chapel-like appendage visible from some points of view, the buildings might be taken for those of a summer hotel with its flag floating from the tall mast before it. But although in these days of ours a library may very well be numbered among the attractions of a hotel, who ever heard of a chapel as one of them, at least of an American one? If not a hotel, then, surmises the traveller, this must be. a school, and he is right. He is looking at Saint Mark's School at Southborough, a name familiar to schoolboys for more than a generation. As one leaves the village and comes nearer to the school, the group of buildings it may at first have seemed to be is found to be but one in reality, a circumstance sharply differentiating Saint Mark's from many of the influential preparatory schools of America. Where other important schools have purposely planned to separate their members into several household groups, as notably at Lawrenceville, Saint Mark's has as intentionally pursued an opposite course and brought its entire life under one roof. Each method has its distinct advantages, and, no doubt, its enthusiastic advocates. The question practically resolves itself to a matter of numbers. The system that works well at Saint Mark's, with its one hundred and twenty-five boys, would scarcely be feasible at Lawrenceville, with its larger numbers. That which makes for convenience and simplicity at the smaller school might very well bring about complexity and confusion in the larger. The wisdom of each system as applied in particular instances must be judged by its practical workings in such differing types of schools as these of Lawrenceville and Southborough. Save incidentally in the magazine tale already named on a previous page, the New Jersey school has never figured in literature, but it is reasonably certain that St. Mark's is the locale, more or less idealized, to be sure, of that most spirited as well as natural portrayal of boy life at school, "Antony Brade," by the third master of the school, the Reverend Robert Traill Spence Lowell, an elder brother of the author of "The Biglow Papers." Thirty years have elapsed since the book was written, it is true, and the school, with its neighbourhood, has seen many changes in that time, but the tale remains true to essential conditions yet prevailing at Saint Mark's, and may be accepted as a faithful study of a wholesome, healthful school life. It is much pleasanter reading, on the whole, than that somewhat overrated book, "Tom Brown at Rugby," and one receives from its entertaining pages the impression of a healthy, happy life at school; just the kind of existence, indeed, that Saint Mark's aims to afford her charges of the present. Saint Mark's is happily placed. The building fronts the south, forming three sides of a quadrangle, of which a cloistered passage, connecting the east and west wings, constitutes the fourth. 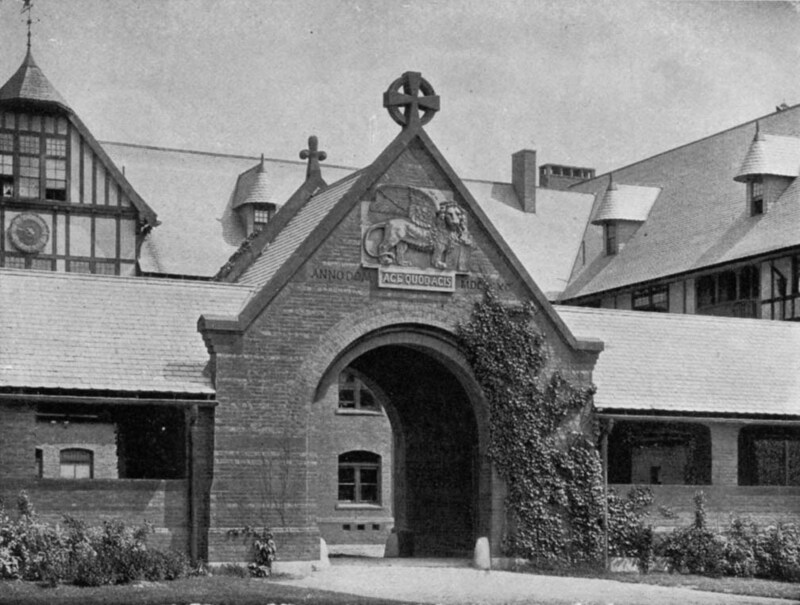 A stone gate-house, gabled and cross-tipped, forms the central feature of the cloister, and above its arched entrance is the winged lion of Saint Mark, with the motto of the school appearing below, "Age Quod Agis." A much happier inscription, indeed, than one which the author of the "Heir of Redclyffe" assured the writer she herself saw sculptured beneath the open mouth of a carven lion at the doorway of an infant school in a small English town, ---"Suffer little children to come unto me and forbid them not." No such grim welcome as this confronts the new boys who year by year find their way to Southborough and the shelter of Saint Mark's. ENTRANCE TO THE QUADRANGLE, SAINT MARK'S. A chapel of several bays and with an apsidal end forms a southern prolongation of the west wing, and is entered from the cloisters, as well as from the low, spired tower on its west side. It is a Romanesque structure of excellent proportions, and if we enter we shall find an interior that is both simple and impressive. There is a lofty, open-timbered roof with massive hammer-beams, oaken seats follow the lines of the building, and there is a small organ in its organ chamber on the east side. The seats for the vested choir of St. Mark's boys are raised a single step above the nave, and the chord of the apse is marked by the altar rail. The chapel was a gift to the school by Mr. August Belmont in memory of his brother, Raymond Rodgers Belmont, while cloisters and gateway commemorate Arthur Welland Blake. As at Saint Paul's and several other American schools under the control of the Episcopal Church, English customs and nomenclature are followed to a slight extent. Consequently one hears of "forms" instead of classes; of an "upper school," and of Christmas, Easter, and Trinity terms. There are six forms at Saint Mark's, a year being required for the work of each. The fifth and sixth forms constitute the "upper school," and to arrive at this stage of scholastic progress is the goal of all the younger boys. The members of the "upper school," it should be known, are favoured above their fellows, for to them is accorded the privilege of studying in their own rooms, and other distinctions are theirs, no doubt, in return for having climbed so far up the hill of learning. The boys of the three lower forms are not assigned to separate rooms but to dormitories with windowed alcoves. An air of almost military simplicity pervades their quarters, for the members of these forms are not permitted to surround themselves with very much in the way of impedimenta. Accumulation of that character comes about only with translation to rooms of their own, when they shall have become "upper form" fellows. Adjoining each dormitory is a master's room, a natural conjunction not perhaps fully appreciated on the part of the occupants of the dormitories. There is not unnaturally a good deal of rivalry among the forms, but it is of a healthful character, confined to advancement in school work and to prowess in athletics. One hears often of "Saint Mark's Scholars," for although all of the pupils are hers in the wider sense, there are at least six boys who are Saint Mark's Scholars in a very special sense indeed. These are the fortunate winners of scholarships, the highest with an income of four hundred dollars, two of two hundred each, with three more to which no stipend is attached, but which are allotted to boys of the highest rank. In each form, also, there are prizes awarded for a certain specified rank in conduct and attainments, and Founder's Medal is the coveted prize of that member of the graduating class who stands the highest above a specified rank, of course, in both studies and conduct, for the previous three years. The holder of the Founder's Medal at Saint Mark's certainly earns his honours. Thy sons have fought for thy fair name. O Lion with the Eagle's wing." 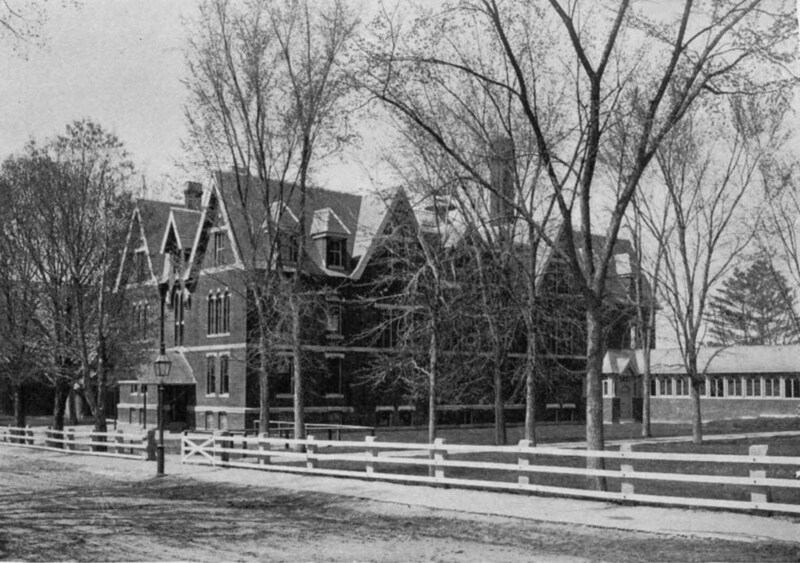 The doubtful experiment, as it appeared to some, of founding a "church" school in New England, in the fifties, soon ceased to be in any sense doubtful, and ere Saint Paul's School had completed its tenth year its dormitories were filled, and applicants for admission could obtain it only after a long period of waiting. 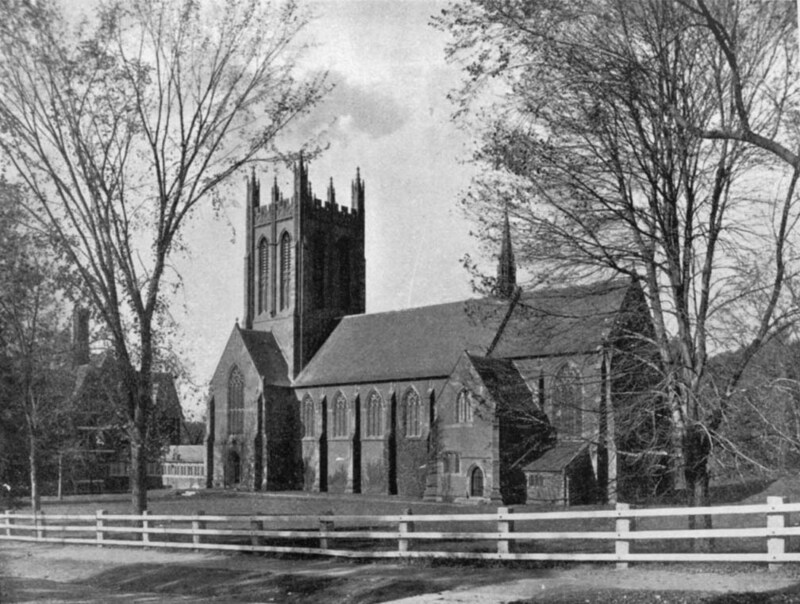 Evidently the time was ripe for establishing a similar foundation elsewhere in New England, and so in 1865 Saint Mark's was founded by Mr. Joseph Burnett. It was its founder's intention that it should be a "home school," and such it continues to be at this day when, from a building sheltering twelve boys, it contains, still under one roof, one hundred and twenty-five. "That the entire life of the school should be under one roof," writes one of its masters, "its chapel services, study, recitations, eating, and sleeping, means much, not only for convenience, but also for community of interest among the boys, and between masters and pupils." 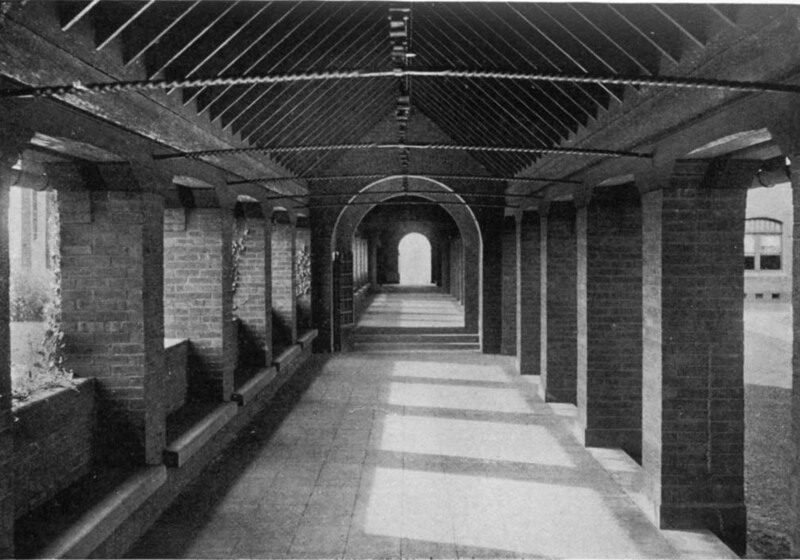 CORRIDOR, LOOKING TOWARD THE CHAPEL, SAINT MARK'S. 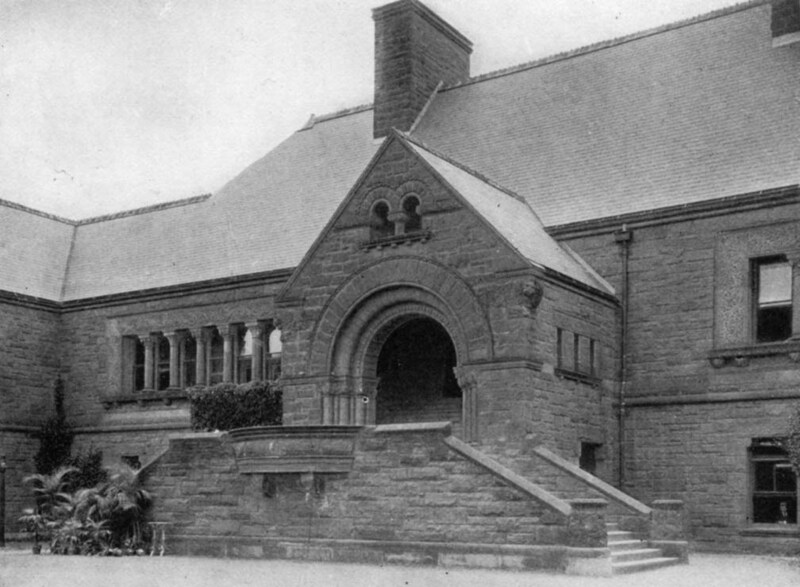 The larger part of the present school fabric was completed in 1890, the architect being Henry Forbes Bigelow, an alumnus of Saint Mark's, but in 1902 another wing was added to the structure, in which laboratories and a library are provided. In its thirty-seven years of existence the school has had six head masters, the third of whom was the Reverend Robert Lowell, already mentioned. Upon his removal to Schenectady in 1873 he was succeeded by the Reverend James I. T. Coolidge, who resigned in 1882, and has long been an honoured resident of Cambridge, Massachusetts. The fifth head master, Mr. William E. Peck, remained at the head of Saint Mark's for eleven years, and had the satisfaction of seeing the institution greatly increase in strength and efficiency during that period. His skilful management, indeed, made possible much that is now doing at Saint Mark's. 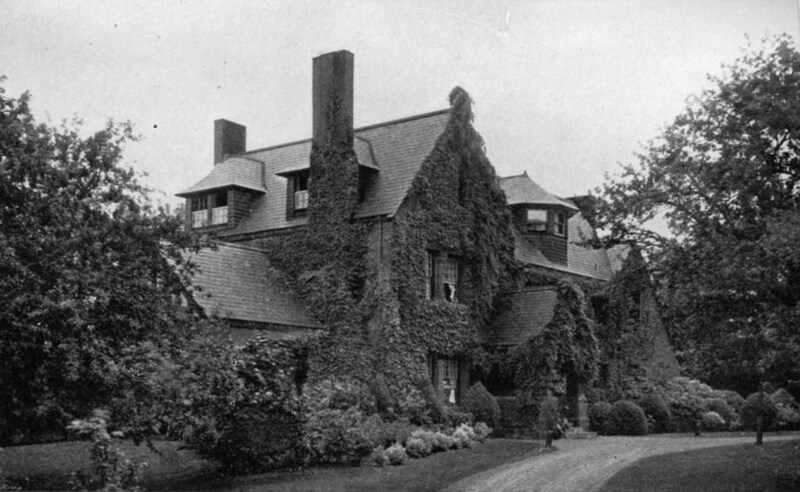 Upon his leaving in 1893 to found a school in Pomfret, Connecticut, the present head master succeeded, the Reverend William Greenough Thayer. From the beginning the various members of the Burnett family have been watchful for the interests of the school. Discouragements and obstacles there were at the outset, but these the founder overcame by his persistency and foresight, serving for many years as its treasurer, an office in which he was followed by his son, Mr. Harry Burnett, who is also a trustee of the school. Year by year Saint Mark's grows more attractive to the eye. Nature, as Mr. Lowell has said, took kindly to her, enfolding her in ivies and woodbines, and permitting the friendly grass to come close to her feet. And in these very latest years her work has been intelligently supplemented, for even kindly Mother Nature needs not only encouragement but some little well-meant hints now and then as to the best methods of doing things. Accordingly shrubbery has been judiciously planted, trees set out in effective conjunction, lawns made soft as velvet, while indoors, photographs and casts render the already attractive interior yet more so. Such is Saint Mark's School to-day. A homelike institution admirably following out the aims of its founder, and sending into the world of university life, or into the larger world of business, those for whom a well-balanced system of school training has done whatever training can do, toward equipping them for the future. Saint Mark's has given them the education she deems most fitting for the sons of Christian gentlemen, and sends them forth from her walls in the confident expectation that they will prove themselves all that Christian gentlemen should be.